This Post has already been read 386 times. 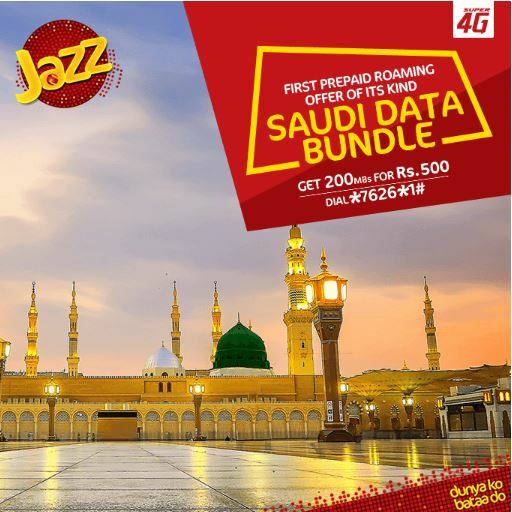 For the first time in Pakistan, Jazz offers Prepaid Data Bundle in Saudi Arabia (for all operators). According to details, now Jazz customers can enjoy 200 MBs in 500 rupees only. How much is 200 MBs? Mix of browsing, whatsapp audio and video calls till the bundle expires. Note: Whatsapp will work in Saudi Arabia on Jazz Bundle. Activation: Just dial *7626*1# from Pakistan for bundle activation (with 500 balance in your mobile). Or simply call 111. For activation from Saudi Arabia, ask your fnf in Pakistan to first get your roaming activated by calling 111. Then you can simply dial *7626*1# from Saudia to activate this bundle. Reactivation: The bundle is non-recursive. Once the bundle expires, your data will stop working. This will ensure that your remaining balance is safe. For reactivation of Bundle dial *7626*1# again. Coverage: The Saudi Bundle will work in Saudi Arabia only (All operators). It will not work in Pakistan or anywhere else in the world except Saudi Arabia. The bundle is available for Jazz customers only. Warid customers will be included soon.